An estimated 10 million Americans show evidence of Age-Related Macular Degeneration (AMD), a progressive eye condition that can destroy “straight-ahead” vision. 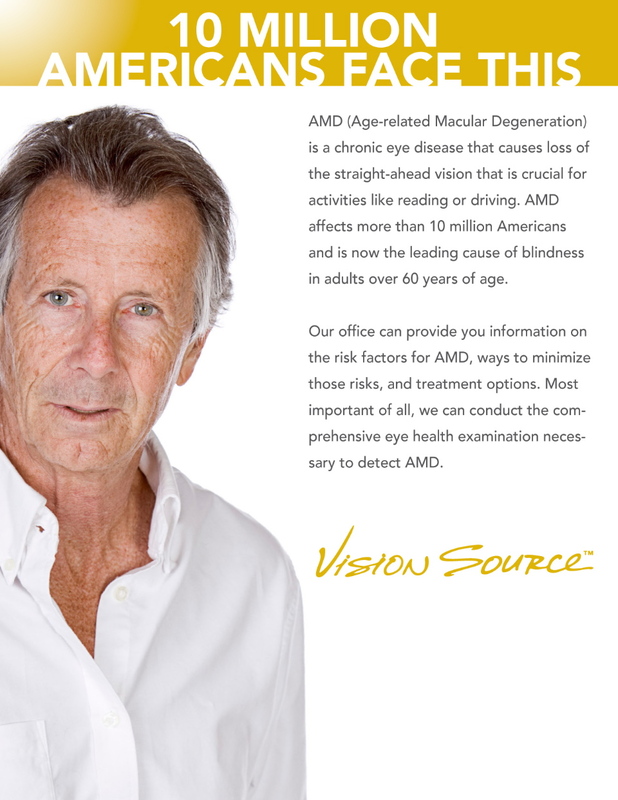 February is AMD Awareness Month and I encourage all people, especially those at higher risk for this disease, to familiarize themselves with the potential symptoms and need for regular eye examinations. To help people better understand this disease, we’ve prepared a list of Frequently Asked Questions about AMD. A: The causes of AMD are still unknown. One form of AMD (Dry) may be caused by aging and thinning of the macular tissues, pigment deposits in the macula, or a combination of the two. The other form of AMD (Wet), results when new blood vessels grow beneath the retina and leak blood and fluid. This leakage causes retinal cells to die and creates blind spots in central vision. Q: Who is at risk for AMD? A: Risk factors for AMD include: Smoking, High Blood Pressure, Obesity, and Family History of AMD. Also, Caucasians and females are more prone to AMD. Q: What are the symptoms of AMD? A: Early symptoms of AMD included blurred vision or dark spots in the center of vision. The symptoms can appear painlessly and gradually, making early detection and treatment essential. Q: How can AMD be detected? A: Early-stage AMD can be detected through a comprehensive eye exam that includes a visual acuity test and dilated eye exam. If AMD is detected, further tests may be required. Q: Can AMD be cured? A: There is no cure or AMD at this time. There are, however, certain treatments that can slow or minimize vision loss, and, in some cases, even improve vision. Q: How is AMD treated?